Mined from the continent of Italy, Bianco White Carrara marble tiles are highly coveted for high-end construction projects, particularly in mansions and commercial skyscrapers. White tile of any kind practically screams luxury, so it stands to reason that homeowners and business corporations with money will want this. The next step in differentiating a high-end structure from the other would then lie in the details like what kind of marble. While there are many different kinds of marble tile in the market—even engineered tile, what’s highly coveted is natural stone tile because of its organic makeup. Its natural evolution from a travertine stone to a luscious lacquer stone with organic colors brings a touch of elegance to a space that rivals other kinds of natural stone. Perhaps what makes marble tile so popular is that it comes in a variety of colors, so it gives builders the option to design unique builds—even if their contracted for a fleet of residential homes or one huge commercial structure. But when it comes to stocking a supply of white tile, while plain white is striking, buyers still seem to gravitate toward something that is clean and neutral, but not too dull—which is why they prefer a Bianco White Carrara. Bianco White Carrara tends to be one of the top choices for builders who are looking to stock a brighter marble tile for their next project. 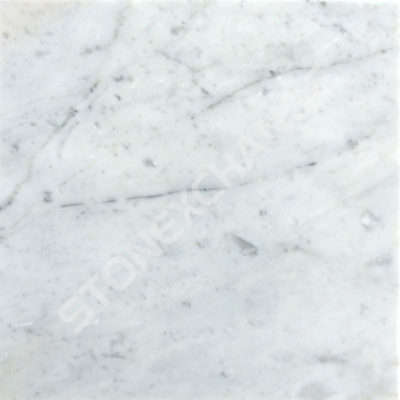 This particular tile has a moderate movement of light grey veining throughout the slab. It’s grey veining tones down the white background nicely without overpowering the overall appearance of the tile. Buyers still will get a white tile, but the grey veining offers a more classic tone that is suitable for both modern and classic building projects. Where Can You Find Bianco White Carrara Marble Tile? At Nalboor Tiles, Bianco White Carrara is the least expensive of the white marble tile family making it an unbeatable purchase for contractors who are looking to purchase it at a wholesale price. Storing building materials at a building site isn’t always the safest thing to do. Most of the time, construction sites are not secure and they are open to the elements and thieves who can come in and take your precious Bianco Carrara tile. So, when it comes to ordering in bulk, just be smart! For all liability purposes, Nalboor Tiles requires that all orders be shipped directly to a secure warehouse that must have a docking station so that our delivery team can safely transport your bulk order of Bianco White Carrara tiles from our truck to your location. Another great feature about buying in bulk from Nalboor Tiles is that you have the advantage of purchasing your Bianco White Carrara marble tile at a cost that’s less than the original unit price. To qualify for the lowest price, a minimum of one full crate must be ordered. You’ll be able to order directly through our website and the discount will be applied at checkout. If you’re interested in purchasing more than one full crate at an order over 4,000 square feet, then you’ll need to speak with one of our friendly representatives to process your order and arrange the logistics of the delivery. Nalboor Tiles is located in Miami, Florida. So, for companies based in the South Florida area, you are more than welcomed to pick up your supply of Bianco White Carrara tiles if you have the transportation to do so. Before you place your order of Bianco White Carrara tile, we invite you to get a free sample so that you can see for yourself the quality of our product. This is also something you can conveniently request through our website. As a building contractor, we highly recommend always stocking a healthy supply of Bianco White Carrara tile. Whether you’re contracted for commercial or residential properties, you can use this natural stone tile to incorporate in interior and exterior finishes that include floor and walls. It’s a perfect tile for backsplashes to bring a little brightness to small spaces like bathrooms and serves as a great conversation piece for kitchens. This type of marble tile is synonymous with luxury. Install it around soaker tubs, vanity countertops and even decorate the fireplace with it to create a modern city vibe. Order your free sample of Bianco White Carrara marble tile today and then place your order directly online for ease and convenience. If you have any questions, contact a Nalboor Tiles representative online or call us directly at 305-501-4548.